It is about time I posted something on here. Little did I know that having a baby, selling a house, buying a new house, moving to a new state, and going back to work as an auditor during busy season was going to have an impact on this blog. I miss blogging and I miss all the baking. I wanted to post something for St. Patricks's Day, but the milkshakes I made this evening had way too much mint and ended up in the trash. Then I remembered I made these brownies last month and thought I better post something for you guys before you forgot about me. I am really trying to find the time to get back to baking an blogging, so bear with me. In the meantime, go make these brownies! They are incredible. My only tip to making this is to use really good chocolate. There aren't many ingredients in here so it really makes a difference. 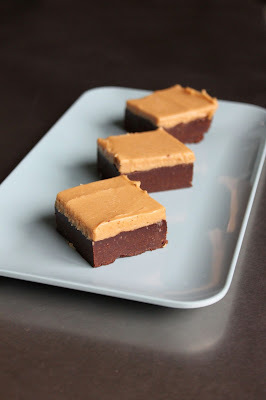 The first time I made these I did not put the peanut butter topping on them and have since decided this is my new go-to brownie recipe. They are incredibly indulgent and absolutely delicious. Preheat the oven to 325°F. Line an 8-inch square baking pan with foil so that the foil extends at least two inches beyond the edges of 2 opposite ends. Melt the chocolate with the butter in the top of a double boiler. Remove from the heat and set aside to cool. In a medium bowl, whisk together the eggs and sugars until well blended and smooth. Add the salt, then the melted chocolate and vanilla extract and mix until well blended. Add the flour and mix until blended. Scrape the batter into the prepared pan and smooth it into an even layer. Bake the brownies for 22 to 25 minutes, until the top is no longer shiny and the brownies are set (they will still be moist inside). Cool completely. In a medium bowl, using a rubber spatula or wooden spoon, beat the peanut butter with the soft butter until smooth. Add the confectioners’ sugar and beat until blended and smooth. Stir in the vanilla extract. Spread the frosting over the cool brownies and refrigerate for at least one hour before cutting.